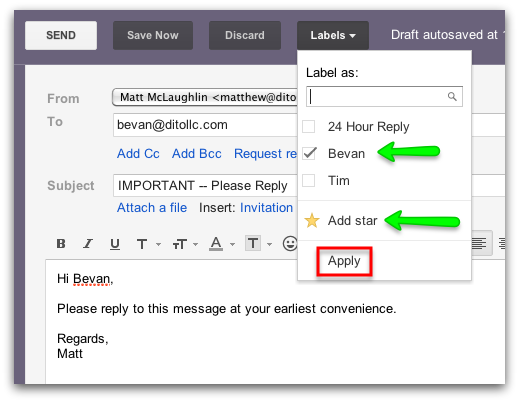 Organizing messages with labels and stars is a key part of Gmail users day to day experience when working in their inbox. Well, this feature has just been expanded in a way that allows you to star and/or label your message when you're composing it and before you hit send. By clicking on this 'Labels' button, you have the ability to add a label to the message or add a star before you send it. As you can see above, I have chosen to add my 'Bevan' label to the message as well as starring it. Remember to click on 'Apply' so the choices you made are reflected on the email message. If you would like to check and see if your choices were applied to the message, you can click on your 'Sent Mail' system label. If this was the most recent message you have sent, it will be at the top of the list. Another way to confirm that your choices were applied to the message is to wait until Bevan replies to this message. A conversation will begin to form and the label & star will be applied to that conversation. How will you be utilizing this new feature? Let us know if the comments section below! Also, if you found this blog post informative and fun, give it a +1 so others can receive the same benefits.